A good way to beat global warming is to give free rein to imagination and create ecological things. Can you imagine combining a free pizza party with solar cooking? 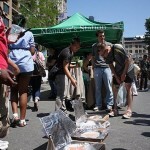 A group of students from New York City have found an environmentally friendly way of cooking. The group of students from Brooklyn’s James Madison and Edward R. Murrow high schools have designed a greener mode of making your own pizza not in an electric oven but in solar-powered pizza boxes. These green ovens can heat up to 200-degrees on a hot day which is more than required to cook a pizza. These pizza boxes are covered with tin foil and are completely safe for the food to get cooked evenly with no fear of getting burnt. It is generally observed that young minds with their purchasing patterns, life-style choices and networks with schools, universities, clubs, and sports can influence a wider world and influence communities, companies and countries to a greater cause that needs immediate attention and significance.